The book may look like a doorstop, but it won't take long to read, as the pages fly by all-too fast. Although Superintendent Roy Grace is the protagonist, the plot takes precedence in DEAD MAN'S FOOTSTEPS, with Roy's personal life taking a back seat apart from a few hints that the relationship with Cleo might be on the way out. 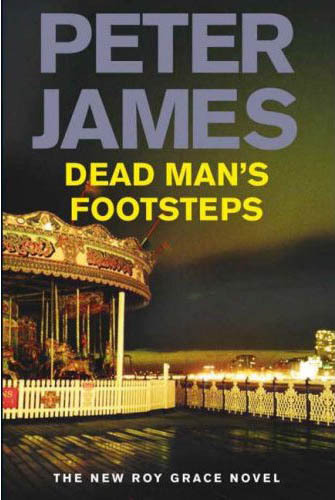 Peter James is a master at juggling plot threads, in quadruplicate on this occasion. At the start of the book, the body of a young woman, long dead, is found in a storm drain in Brighton. Roy is one of the team called in to investigate, and finds himself increasingly tense as the circumstances seem to fit rather too well to the body being that of his long-missing wife, Sandy. In a second storyline, petty criminal Ronnie Wilson is due to meet his latest mark. The only problem is that it is 11 September 2001, and the meeting is in the mark's office at the World Trade Center. A third tale is that of Abby, living in a Brighton flat in dread of an unknown threat. She's obsessively careful about making any sort of move into the outside world, but she doesn't think to check the lift. Its cable breaks, and she's trapped - the alarm doesn't work either. The fourth thread is across the other side of the world, in Australia, where the drought in the Melbourne area leads to a grim discovery in the boot of a car found in a river bed. How or if these various events are all related is the basis of the book - the narrative switches between each story, while at the same time Roy has to deal with interdepartmental politics and the return of the odious Cassian Pewe, favourite of Roy's superior, Alison. It doesn't matter that it isn't hard to work out how all these plots are tied in together. Peter James is masterly, not just at keeping all the balls in the air, but in his moving description of the World Trade Center tragedy, involving the reader in those events and their aftermath in a realistic, exciting yet dignified way, as befits that awful day. The events of 11 September have proved problematic for fictional treatments, but Peter James deftly manages to provide an exciting yet respectful backdrop for Ronnie's cleverest scam yet, while not overdoing the homage. Roy Grace is an attractive character, so I was sorry that his presence in DEAD MAN'S FOOTSTEPS is not stronger, and that more is not made of the camaraderie and tensions between the police, on the individual level as well as the interdepartmental politics level. Never mind, though, the author is adept at ringing the changes of his various plots, wrong-footing the reader constantly in small ways, even if the general picture rapidly becomes rather too obvious for the seasoned consumer of this genre. The tease of an ending will leave regulars eager for the next instalment.